بررسی نقش پارامترهای پتروفیزیکی و سنگ شناسی در ارزیابی پتانسیل نفتی مخزن ایلام (اواخر کرتاسه) در میدان نفتی اهواز از اهداف این مطالعه است. سازند ایلام از نظر سنگ‌شناسی متشکل از آهک، آهک دولومیتی و همچنین مقدار بسیار ناچیز شیل به‌صورت پراکنده است. تغییرات رخساره ای در طول سازند نیز مشاهده می شود. بر اساس توزیع اختصاصات پتروفیزیکی، این مخزن به چهار زون تقسیم شد. نتایج حاصل از بررسی داده های موجود نشان داد حجم شیل محاسبه ‌شده با استفاده لاگ های مربوط به پرتو گاما (CGR) به ‌عنوان شاخص شیل، کمتر از 10 درصد است و لذا مخزن ایلام به عنوان یک سازند تمیز محسوب می شود. بخش های 2 و 3 نسبت به بخش های 1 و 4 دارای شیل کمتری هستند. اگر چه حجم کانی های رسی بسیار کم است ولی تأثیر شدیدی بر پارامترهای پتروفیزیکی بخصوص تخلخل و تراوایی دارد. میانگین اشباع آب سازند ایلام 8/26 درصد و همچنین اشباع آب کاهش نیافتنی آن حدود 3/3 درصد تخمین زده شد. بخش میانی مخزن با اشباع آب کمتر نسبت به سایر بخش‌ها و میانگین تخلخل مؤثر حدود 7/14 درصد توصیف می شود. میانگین تراوایی محاسبه شده حدود 3/8 میلی دارسی است و تغییرات آن رابطه مستقیمی با تخلخل مفید نشان می دهد. همه این نتایج تأییدی بر این موضوع است که بخش میانی سازند ایلام (زون 2 و 3) در مقایسه با بخش های دیگر (زون 1 و 4) دارای پتانسیل نفتی و ذخیره هیدروکربنی بالاتری است. Petrophysical and lithological parameters study of Ilam reservoir in Ahvaz oil field is the main aim of the present research work. Ilam Formation consisted lithologically of limestone, dolomitic limestone, and less quantity of scattered shales. Facies changes are also observed through the formation. On the basis of petrophysical parameters distribution the reservoir divided into 4 zones. The results indicated that shale volume calculated by CGR log, as a shale index, is less than 10% and so the Ilam reservoir is clean formation. Shale quantity is low in zones 2 and 3 than zones 1 and 4. However, the shale volume is very less but its effect on petrophysical parameters especially porosity and permeability is intense. The Ilam Formation is estimated to have 26.8 % water saturation and 3.3% of irreducible water saturation. Middle part is characterized by low rate of water saturation compared to other parts and along with effective porosity average in the range of 14.7%. Calculated permeability average is 8.3 mD. Permeability variation is indicating a direct relation with the porosity. All these results are emphasized that the middle part (zones 2 and 3) is in better condition in view of oil potential and hydrocarbon reserve in comparing to other parts. آقانباتی، س. ع.، 1383- زمین‌شناسی ایران، سازمان زمین‌شناسی و اکتشافات معدنی کشور، 606 ص. 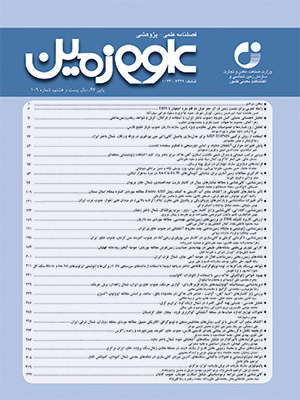 درویش­زاده، ع.، 1370- زمین­شناسی ایران، نشر دانش امروز، 901 ص. سراج، م.، 1384- تحلیل ساختاری مقدماتی میادین نفتی مناطق نفت‌خیز جنوب (محدوده فروافتادگی دزفول شمالی). گزارش شماره پ-5613، شرکت ملی مناطق نفت‌خیز جنوب. مطیعی، ه.، 1372- زمین‌شناسی ایران، چینه‌شناسی زاگرس، سازمان زمین‌شناسی کشور، تهران، 682 ص. مطیعی، ه.، 1374- زمین‌شناسی نفت زاگرس 1 و 2، انتشارات سازمان زمین‌شناسی کشور، تهران، 1024ص. Adekanle, A. and Enikanselu, P. A., 2013- Porosity prediction from seismic inversion properties over ‘XLD’ Field, Niger Delta, American Journal of Scientific and Industrial Research, 4(1): 31-35. doi:10.5251/ajsir.2013.4.1.31.35. Al-Ajmi, F. and Holditch, S., 2000- Permeability Estimation Using Hydraulic Flow Units in a Central Arabia Reservoir, Paper Presented at the SPE Annual Technical Conference and Exhibition, held in Dallas, Texas, 1–4 October. Borai, A., 1987- A new correlation for the cementation factor in low-porosity carbonates, J. SPE Formation Evaluation, V. 2 (4), p. 495-499. Bradford, S. A. and Leij, F. J., 1995- Wettability Effects on Scaling Two- and Three-Fluid Capillary Pressure-Saturation Relations, Environ. Sci. Technol., V. 29 (6), p. 1446–1455. DOI:10.1021/es00006a004. Burke, J. A., Schmidt, A. W. and Campbell, R. L., 1969- The Litho-Porosity Cross Plot, Log Analysit, Vol.10, No.6, P.25. Clavier, C., Coates, G. and Dumanoir, J., 1984- Theoretical and experimental basis for the Dual-Water model for interpretation of shaly sands, SPE-06859, April, 153-168. Costa, A., 2006- Permeability-porosity relationship: A reexamination of the Kozeny-Carman equation based on a fractal pore-space geometry assumption, Geoph. Researvh Let., 33 (2), L02318 , DOI: 10.1029/2005GL02513. Dandekar, A. Y., 2013- Petroleum reservoir rock and fluid properties, CRC Press publishing, Second Edition, 544P. ISBN 1439876452, 9781439876459. Darcy, H., 1856- Les fontaines publiques de la Ville de Dijon: Paris, Victor Dalmont, p. 590–594. Darling, T., 2005- Well logging and formation evaluation. Gulf Professional Publishing, ISBN: 9780750678834, 336P. Dejam, M., Ghaza, M. H., Mashayekhizadeh, V. and Kamyab, M., 2011- Factors affecting the gravity drainage mechanism from a single matrix block in naturally fractured reservoirs,Porous Media, 2(2):115-124, DOI: 10.1615. Donaldson, E. C. and Alam, W., 2008- Wettability, Gulf Publishing Company, Houston, TX. Doveton, J., 1986- Log analysis of subsurface geology, concepts and computer methods, Wiley, New York. 273P. Doveton, J., 1994- Geologic log analysis using computer methods: AAPG Computer applications in geology, AAPG Bull., No. 2, 169 p.
Dunham, R. J., 1962- Classification of carbonate rocks according to depositional texture, in W. E. Ham, ed., Classifications of carbonate rocks—a symposium: AAPG Memoir 1, p. 108–121. Ellis, D. V. and Singer, J. M., 2007- Well logging for earth scientists, Springer Science & Business Media, 697 p.
El-Sebakhy, E. A., Asparouhov, O., Abdulraheem, A. A., Al-Majed, A. A., Wu, D., Latinski, K. and Raharja, I., 2012- Functional networks as a new data mining predictive paradigm to predict permeability in a carbonate reservoir. Expert Systems with Applications. 39, p.10359-10375. Feyzullayev, A. A., 2013- Migration pathways of hydrocarbons in South-Caspian Basin , J Geol. Geosci., V. 2 (3), 6p. , http://dx.doi.org/10.4172/2329-6755.1000127. Gardner, J. S. and Dumanoir, J. L., 1980- Litho- density log interpretation, Trans, Soc. Prof. Well Log Analysts 21 St Logging Symposium, Paper N. Geol. Bull., V.65 (7), p.1285– 1298. GSI (Geological Survey of Iran), 1971- Stratigraphic lexicon of Iran, Ministry of Industry and Mines, Report No. 18, Second edition, 376P. Haro, C., 2006- Permeability modeling in porous media: Setting Archie and Carman-Kozeny right, Paper SPE 100200 Presented at the SPE Europec /EAGE Annual Conference and Exhibition, Vienna, Austria, 12-15 June. doi: 10.2118/100200-MA. Harvey, P. K., 2005- Petrophysical properties of crystalline rocks, Geol. Soci. London, 351P., ISBN 1862391734, 9781862391734. Hearst, J. R., Nelson, P. H. and Paillet, F. L., 2000- Well logging for physical properties, John Wiley & Sons, Ltd, Chilchester, 492P. Hurst, A., 1990- Natural gamma ray spectrometry in hydrocarbon- bearing sandstone from the Norwegian Continental Shelf, In A. Hurst, M. A. Lovell, And A. C. Morton(eds), Geological Application of wire line logs, Geol. Soc. Spec. No. 48, p. 211- 222. Hussein, R. A. M. and Bakri Ahmed, M. E., 2012- Petrophysical evaluation of shaly sand reservoirs in Palouge-Fal Oilfield, Melut Basin, South East of Sudan, Journal of Science and Technology, V. 13 (2), 20P. ISSN 1605 – 427X, Engineering and Computer Sciences (ECS), www.sustech.edu. James, G. A. and Wynd, J. G., 1965- Stratigraphic nomenclature of Iranian Oil Consortium Agreement Area. AAPG.Bull., V. 49 (12), p. 2182e2245. Kadhim, F. S., Samsuri, A. and Kamal, A., 2016- Correlation between cementation factor and carbonate reservoir rock properties, Researcher, V. 8(1), p. 30-65. Kamel, M. H. and Mabrouk, W. M., 2003- Estimation of shale volume using a combination of the three porosity logs: Journal of Petroleum Science Engineering, V. 40, p.145-157. Liu, K., Tang, X., Rashid, A. and Wei, X., 2012- Hydrocarbon migration and accumulation models revisited from a reservoir engineering perspective, Adapted from oral presentation at AAPG International Conference and Exhibition, Singapore, September 16-19, 32P. Neasham, J. W., 1977- The morphology of dispersed clay in sandstone reservoirs and its effect on sandstone shaliness, pore space and fluid flow properties, in Proceedings SPE Annual Fall Technical Conference and Exhibition, Society of Petroleum Engineers, p8. Poupon, A. and Leveaux, J., 1971- Evaluation of water saturation in shaley formations. 12th Annual Society of Professional Well Log Analysts Logging Symposium Transactions, Dallas, Texas,May 2-5, Paper 0.2P. Ravanshad, M. S., Soleimani, B., Larkee, E. and Soleimani, M., 2017- Petrophysical evaluation and reservoir quality of Ilam Formation (late Cretaceous), Ahvaz Oil Field, Dezful Embayment, SW Iran. Pet Coal, V. 59 (2), p.135-145. Sasaninia, N., Jahani, D., Habibnia, B. and Kohansal Ghadimvand, N., 2017- Reservoir characterization and geostatistical modeling of Ilam & Sarvak formations in one of oil fields in Southwest of Iran, Open Journal of Geology V. 07(06), p. 789-795. Sepehr, M. and Cosgrov, J. W., 2004- Structural framework of Zagros fold-thrust belt of Iran, Marine and Petroleum Geology, v. 21, p. 829-843. Shadizadeh, S. R., Habibnia, B. and Syllabee, R., 2009- Investigation and selection of suitable layers in Bangestan reservoir for hydraulic fracturing operation, Scientia Iranica. Transaction C, Chemistry, Chemical Engineering, V. 16 (2), P. 149-160. Shepherd, M., 2009- Factors inﬂuencing recovery from oil and gas fields, AAPG Memoir, 91, p. 37-46. Sherkati, S. and Letouzey, J., 2004- Variation of structural style and basin evolution in in the central Zagros Izeh zone and Dezful Embayment. Iran, Marine and Petroleum Geology, V. 21, p. 535–554. Soleimani, M., Soleimani, B., Alizadeh, B. and Veisy, A. R., 2017- Carbonate Tight Zones Detection and Their Impacts on Bangestan Reservoir Quality, Ahvaz Oil Field, SW Iran. Inte. J. of Emerging Research in Management &Technology, V. 6 (3), P. 21-30. Soubotcheva, N. and Stewart, R. R., 2004- Predicting porosity logs from seismic attributes using geostatistics, CREWES Research Report, V. 16, 14P. Tiab, D. and Donaldson, E. C., 2004- Petrophysics theory and practice of measuring reservoir rock and fluid transport properties, Gulf publishing company Houston, Texas, p.889. Yang, L., 2015- A petrophysical evaluation of the Trenton-Black river formation of the Michigan basin", Master's Thesis, Michigan Technological University, 52P.